Released by Mirrosoft in 1990, Speedball 2 was a futuristic, American football-like cyberpunk sports game that placed you in control of a team of rookies called Brutal Deluxe. Appearing on the Amiga, PC and other platforms, it put almost as much emphasis on battering your opponents half to death as scoring goals. Recalling its bloody excellence below is Jason Saunders's review from the very first edition of PC Format in 1990. Violence in sport. From verbal fisticuffs between umpire and tennis player to the occasional punch up on the football pitch, the air of competition fuels sudden outbursts of temperament which can result in acts like controlling bodies and commentators alike take a dim view of. But the viewers love it. Certain social scientists theorise that the morality of a society's sport reflects directly on society. Take the collapse directly on that society. Take the collapse of the Roman Empire – its increasing corruption reflected by the Romans' gross penchant for Christians, lions and little in the way of Queensbury rules to moderate the match. But the viewers loved it. What else is going on during PC Gaming Week? In modern times, people agree that sport is good for you and stress the importance of co-operation and the value of physical exercise. But the sight of 200lb 'sportsmen' smashing the hell out of each other with sticks in the name of ice hockey makes one wonder. And what if that apparent violence was condoned? What if you could score points by turning the match into a bloody spectacle reminiscent of the Roman arena? Such a sport could resemble Speedball 2. Two teams scoring goals, with few rules to stop them bashing the living daylights out of each other. Someone gets in your way, you smack 'em. Someone's got to the ball, you maim them. Someone just happens to be stood there, hack, stomp and generally trash him. Futuristic and violent, Speedball is similar to the game from the film Rollerball, but without the skates and scooters. Points come from scoring goals and hitting various objects, including members of the opposing team. 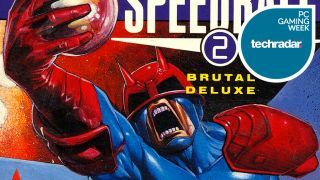 Speedball 2 centres around the team Brutal Deluxe. You take control of not only the men on the pitch, but of transfers and team training. Deluxe can then engage in one of three types of match: knockout, the cup or the league. The knockout, as might well be imagined, is just that. Lose one match and Deluxe is out of the running. The cup is based on a two-leg contest and scores are worked out on aggregate. Then there's the really meaty competition – the league. This is the best chance to improve your skills, along with team strength, and to exchange the team members. In the early stages of the game, the role of the coach takes precedence. At the start of the season, Brutal Deluxe is so ill-trained that the team would do better as a troupe of performing dancers. Now these guys are such a lovable bunch that the coach just has to take them all down to the gymnasium and give them a quick Jane Fonda workout. Who needs to be the strongest, the fastest, the best throwers? This is a complex decision to make. The attack team gets the goals, but the defence prevents the other side from doing the same. Then there's the mid-field. These are the guys that get possession of the ball and can gain some valuable points in the process. So it's on with the coach's hat to settle down to some tough decision making. Training can be carried out for the entire team, the defence, mid-field, attack or substitutes, or individuals. It may seam that training substitutes is of least importance, but over the season this can change. For a start, should one of the players be injured and a substitute put in his place, the match could be lost because of this pansy. But there's a better reason to train the subs. When the entire team is trained, it reaches a new high and can be trained further. Carrying on like this means that Deluxe starts life as a load of namby-pamby mummies' boys and end up harder than Arnie Schwarzenegger. But all this training costs money and, as we all know, money doesn't grow on trees. So where does it all come from? The answer is simple. All over the pitch there are coins for grabbing. These coins can then finance team training. The money can buy more than simple training. Imagine a player that has spent his entire life having prosthetic attachments to enhance his performance, Players of this ilk can be bought as long as you have sufficient cash, or the combination of a Deluxe player's value and cash to meet the cost of this player. If you've ever fancied yourself as a prospective team manager, this could be the chance the find out if you're up to the job. So, there Brutal Deluxe is, happily running around the pit collecting money so that the team can spend a little more time in the gym working on their pectorals. Deluxe ends up having more muscles than the posers on the beach at Cleethorpes, but loses every game. Somehow a happy medium has to be reached between collecting money and scoring points. Scoring is simple in theory, but very difficult in practice. Goals make up the majority of points, but here comes the difference. Instead of the game being determined by the number of goals scored, each game is dependant on the number of points each side can accumulate. This makes the game far more enjoyable for those of us who have problems scoring goals and would prefer a management scenario. For those out there that have been playing the original Speedball and are wondering if it is good, the answer is easy. It's a damn sight better. This game is addictive, and dangerously so. During the time I played it I came close to breaking my joystick and getting my lights knocked out by the guys in the office by objecting to me shouting at the PC. But there's something missing. For a game that sells itself as extremely violent, it isn't. Sure, you get points for incapacitating your opponent, but you don't get the chance to lay the boot in any one individual. Otherwise I would spend most of my time doing so, as this game soon turned me into a blood-crazed loon, reminiscent of those football fans who make Saturday afternoon shopping such a fun pastime. There are some annoying points about the game too. As it only lets you save every four games in the league then, should you have to turn off your computer for any reason, you have to go back several games when booting up again. This may stop you from cheating (only continuing the league when you win, if you lose then you go back one game until you do win) but that's the players' decision to make. Then there are problems with the game play itself. As the computer makes the decision as to which player will be controlled, you can find yourself putting the goalie way out of position when trying to tackle someone else. Then there's the computer-controlled team's ability to set up a series of tackles at a rate you'll never be capable of matching. Another thing that may have you reaching for the reset button is the time it takes a player to realise that he's caught the ball. He'll pounce into the air with the grace of a tiger and catch the ball in a manner that Shilton would be proud of. Then he stands there like a steaming jessie working out what to do, even though you are bashing on the fire button like a thing possessed, then gets tackled and loses possession. I may sound as though I'm slating the game, but I'm not. Certain parts are less than brilliant, but on the whole Speedball 2 is a great game to play on the PC. Its flaws just detract from it a little. And as for Speedball developing from PC virtuality to actual reality, well if this is an example of the sport of the future, then I think I'll avoid a broken neck and stick safely to Scrabble.